What Is DA Form 3355? 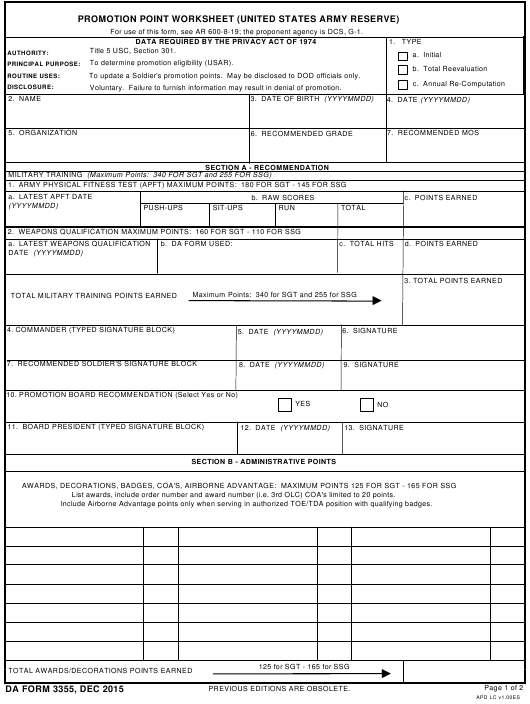 DA Form 3355 is the Promotion Point Worksheet (United States Army Reserve) issued by and used within the Department of the Army (DA). The purpose of the form is to determine service member's eligibility for promotion. The latest edition of the form - sometimes mistakenly referred to as the DD Form 3355 - was issued in December 2015 is still in use and valid today. An up-to-date fillable version of the DA Form 3355 is available for download and digital filing below or can be obtained through the army publishing directorate website. The DA 3355 is used to update a soldier’s promotion points and the information contained within the form may be disclosed to DA officials only. The disclosure and filing processes are voluntary. However, failure to provide information may serve as the grounds for denial of promotion. How To Complete Da Form 3355? For use of this form, see AR 600-8-19; the proponent agency is DCS, G-1. Title 5 USC, Section 301. To determine promotion eligibility (USAR). To update a Soldier's promotion points. May be disclosed to DOD officials only. Voluntary. Failure to furnish information may result in denial of promotion. List awards, include order number and award number (i.e. 3rd OLC) COA's limited to 20 points. Include Airborne Advantage points only when serving in authorized TOE/TDA position with qualifying badges. 1. MILITARY EDUCATION (Maximum Points. 200 for SGT and 220 for SSG): List all military education. 2. CIVILIAN EDUCATION - (Maximum Points.135 for SGT and 160 for SSG) List all civilian education, certifications, or DLPT (with date). I certify that the above total points shown have been accurately extracted from appropriate records and promotion list points indicated are correct. Counseling statement: (Used only when Soldier is not recommended for promotion). I have been counseled on my promotion status and deficiencies. The DA 3355 has four parts: Section A, Section B, Section C and Section D (the very first section contains administrative information and is untitled). Section A is the recommendation section that evaluates the level of a soldier's military training. Boxes 1a through 1c are for providing APFT (Army Physical Fitness Test) scores. Enter the latest date of assessment, raw scores and points earned. Box 1a through 1d are for weapons qualification. Enter the latest qualification date, DA Form used, total hits and points earned. Box 3 is self-explanatory: enter the total of military training points earned. Boxes 4 through 6 and 11 through 13 are authentication boxes for the commander and board president respectively. These boxes require their names, signatures, and the dates of signing. Box 10 contains YES and NO Boxes that signify whether or not there was a recommendation by the Promotion Board. Section B, Administrative points is for listing awards with order numbers and award number, Airborne Advantage Points (for soldiers serving in authorized TOE/TDA position with qualifying badges), all military education and civilian education, certifications or DLPT. Section C is for the total computation of points. It combines all previously listed scores in military training, awards and decorations, and education and provides their total amount. Section D is for authentication. The soldier must certify that the above total points shown have been accurately extracted from appropriate records and promotion list points indicated are correct. Soldiers flagged IAW AR 600-8-2 or barred at the date when fully eligible for automatic promotion, require a DA Form 4187, Personnel Action and the submission of a SIDPERS grade change (GRCH) transaction to be promoted.